Zoho Expense simplifies the task of recording and reporting expenses. If you’re wondering whether you can import/export expense into your books, you don’t have to! With the Zoho Expense/Books integration you can sync and view your expense data from within your Zoho Books account automatically. You can view your list of approved expenses, automatically updated and matched under the existing Chart of Accounts (CoA). Click on the below links to easily navigate through the page. Zoho Expense does not require any steps for it to be integrated with Zoho Books. Our system automatically links both the accounts, provided they both have the same organisational profile. Click on the Purchases tab on the left sidebar of Zoho Books. Click on the Expenses tab to see the list of expenses associated with your account. Click on the filter drop-down present on the top left corner of the page. Select ‘From Zoho Expense’ filter to see the list of approved expenses from Zoho Expense. You can also record reimbursements from Zoho books. To do so, perform the following steps. Click on the Banking tab on the left sidebar of Zoho Books. Select the Account through which reimbursement transactions are done. Go to the Add transaction drop-down and select Employee Reimbursement. 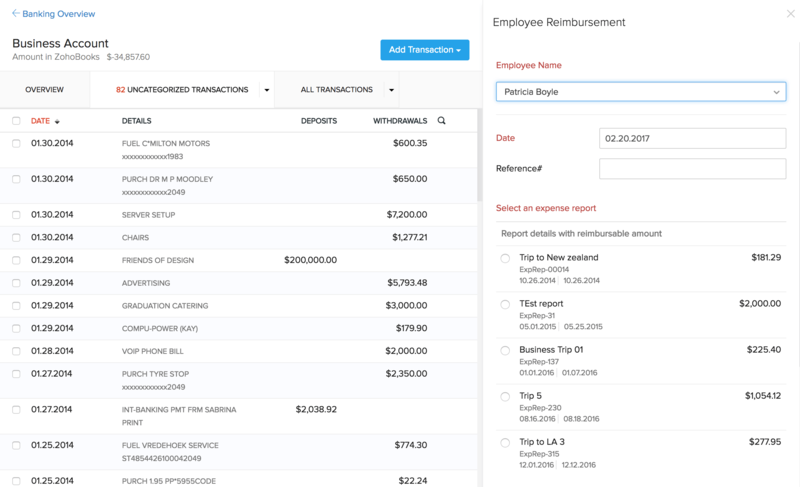 You will see an Employee Reimbursement form on the right side of the screen. On selecting an Employee’s name from the drop down, you will see a list of approved expense reports belonging to the employee, awaiting reimbursement. Select the report you wish to reimburse and click on Save. Expense reports that are reimbursed manually will be tagged as Manually added transactions. However, On importing bank statements into Zoho Books, there arises a need to categorise the statement lines or match it with an existing transaction (reimbursed manually). This is done by following the steps given below. Click on the Banking tab on the left sidebar. 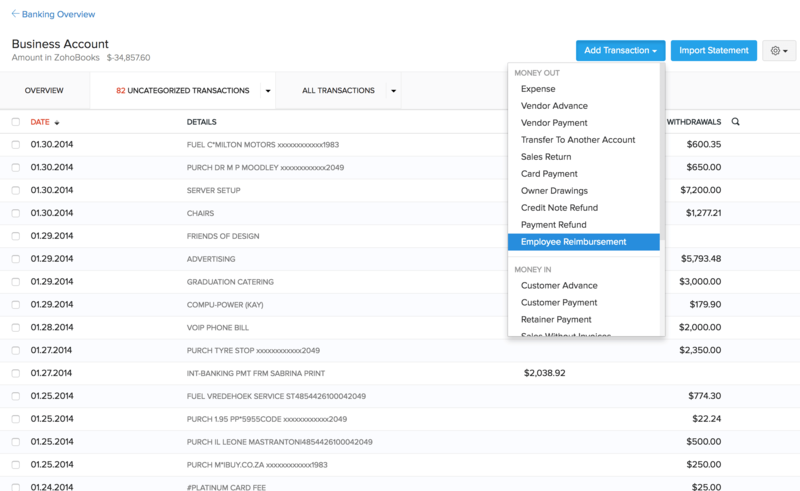 Select the Bank account containing uncategorised transactions. Click on an uncategorised transaction, and you will see a list of transactions that can be matched with your uncategorised transaction. On finding a transaction that can be matched, click on select and match the transaction. If the statement line does not have a matching transaction, or you do not wish to associate it with an existing transaction, then you can categorise it manually using categorise manually option located below the list of transactions. Select Employee Reimbursement from Category drop-down. 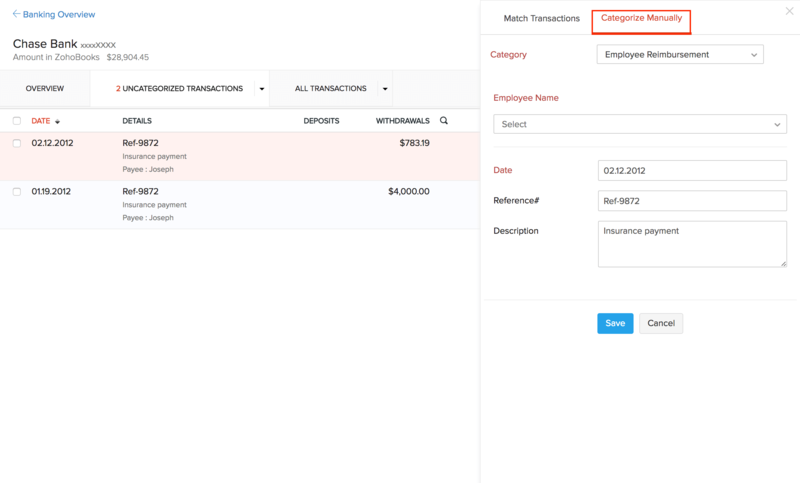 Choose the name of the Employee and the report with which you want to associate your uncategorised transaction. Click on Save. Your transaction has been categorised. 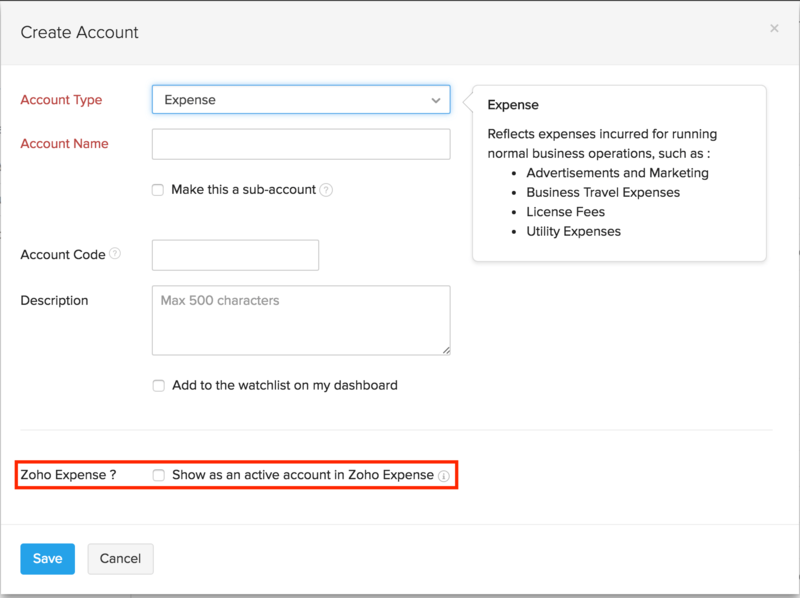 The expense categories created under the categories section of Zoho Expense (Settings > Categories > +New Category) is automatically added under the Chart of Accounts section of Zoho Books. This saves you from re-creating the same category under Zoho Books. Go to the Reports section, and click on the Accountant tab. 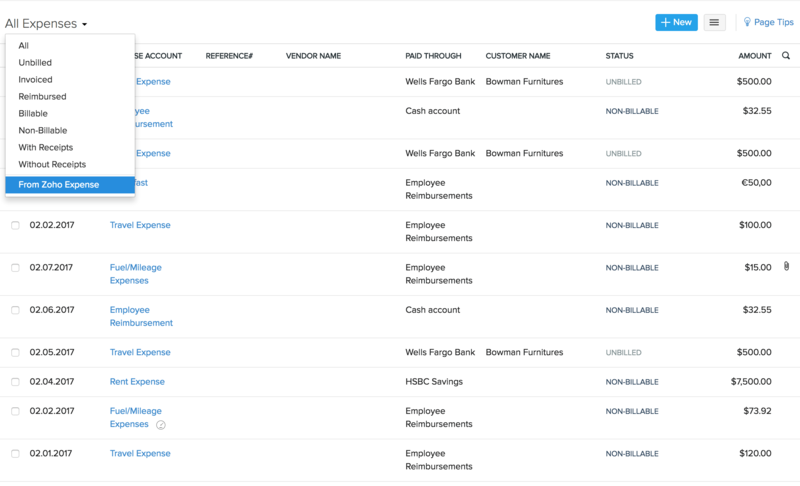 Click on Account Transactions, and you will see a page where you could generate reports based on an account name and a specified date range. Click on the Account Name drop-down and select Employee Advance from under the Asset section. Specify a date range and click Run Report. 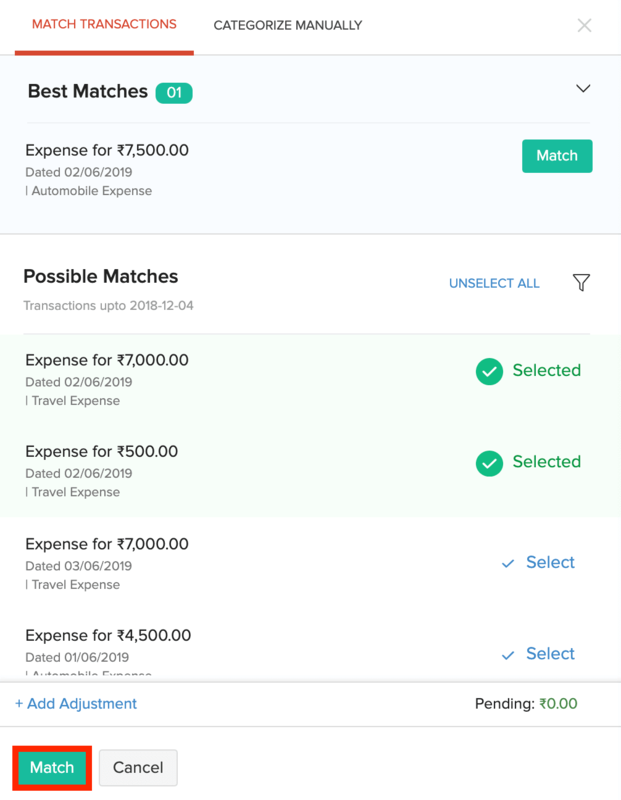 This will show you a list of advance payments made while creating an expense report under Zoho Expense.